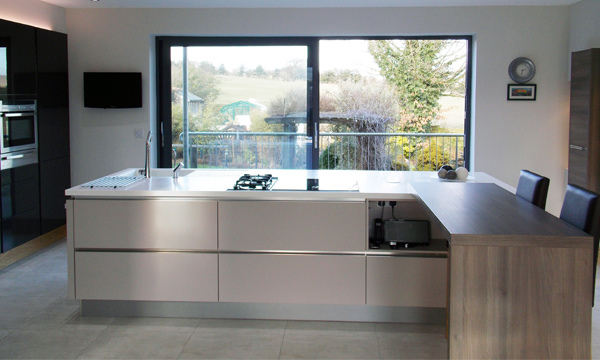 For a simple, efficient and innovative design, a modern German kitchen is the perfect choice. Those with an eye for style will notice that it’s the handle-less convenience offered by modern designs that make them so special. Our latest modern German kitchen design case study is exactly that. A new build home gave one of our designers the chance to spread his creative wings, with more freedom and less restrictions. Above all, organisation reigns supreme in a German kitchen design – everything needs to be easy to reach and in the right place. And perhaps it’s the use of storage space that highlights this the most. Modern German cabinets are well known for their generous space and being able to store heavy utensils and containers easily. The space distribution in a given cabinet ensures there’s enough shelving and flexible spacing to store everything from small appliances to kitchen linens. Handleless units incorporate aluminium panels so the doors can be pulled open from behind. This creates a clean look so as not to distract from the beauty of the kitchen. Choose a Kitchen Design Centre German kitchen for a long lasting, chic contemporary style. ← The new improved Quooker!